This PDF 1.5 document has been generated by TeX / MiKTeX pdfTeX-1.40.12, and has been sent on pdf-archive.com on 12/07/2017 at 11:15, from IP address 193.186.x.x. The current document download page has been viewed 148 times. File size: 193 KB (4 pages). results seem to be promising. dictionary? We think Culturomics could be an answer. of an appropriate statistical analysis. are going to be applied on some statistical transformations which can help to reduce noise. importance in many fields of the modern computer science. change of words based on distributional similarity models. similarity using a specific historical window. each of these algorithms listed in alphabetical order below. We consider that the pair x and y are the time series representation for each of the words to be compared. between each two points along the time series. along any two points in the time series. the size of the two time series. 6. Manhattan distance computes the sum of the absolute values of the differences between the corresponding points from the time series. covariance and the standard deviation of two time series. each of two corresponding pairs divided by the maximum for each case. between the two time series. which helps us to perform the most accurate predictions. the angle between the two vectors of numeric values. to reflect trends more clearly. Google4 . The data is in the range between 1800 and 2000.
of the corpus is lower since it is subject to many changes. Results are obtained according Miller-Charles data set . be compared to human judgments. the scores obtained are very low. This is the reason we propose to apply some statistical transformations. means the maximum number of occurrences. the baseline for the data sets. Table 1: Results working with raw data. window for solving the Miller-Charles benchmark data set. Table 2: Results after normalizing data sets in [0,1]. obtained after rescaling original data. to the most recent data depends on the number of periods. using EMA for the periods 5, 10, 20 and 50 years. Table 3: Results after baseline removal. measuring semantic similarity between single words. Table 7: Best time windows for solving the MillerCharles benchmark data set using culturomics. Miller-Charles benchmark data set  with a high accuracy. time windows could lead to positive results is confirmed. Table 6: Results after smoothing data using exponential moving averages (5, 10, 20 and 50 years). Table 4: Results after rescaling data. moving averages (5, 10, 20 and 50 years). funded by the Austrian Research Promotion Agency (FFG). Bianchini, D., De Antonellis, V., Melchiori, M.
Discovery. World Wide Web 11(2): 227-251 (2008). 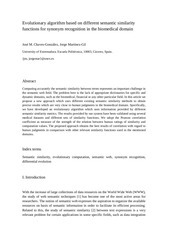 De Virgilio, R., Cappellari, P., Miscione, M.
Search over Semantic Datasets. ER 2009: 205-218. Deza, M.M., Deza, E. Encyclopedia of Distances. Google Books Ngram corpus. GEMS 2011: 67-71.
patterns. Inf. Syst. Frontiers 15(3): 399-410 (2013). 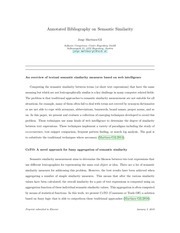 Orwant, J., Pinker, S., Nowak, M., and Aiden, E.
digitized books, Science 331(6014): 176-182 (2011). Detecting Epoch Changes using Large Corpora. This file has been shared by a user of PDF Archive. Document ID: 00623320.